"IBM researchers on Aug. 18, 2011 unveiled a new generation of experimental computer chips designed to emulate the brain’s abilities for perception, action and cognition. The cognitive computing chips, informally referred to as the “brain chip,” could yield many orders of magnitude less power consumption and space than used in today’s computers." 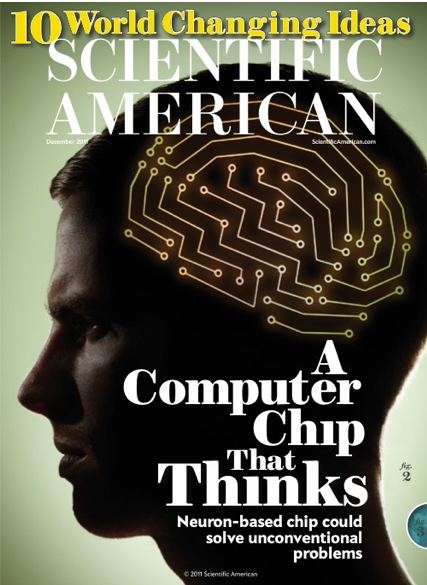 December 2011 issue of Scientific American chronicles “10 World Changing Ideas” and amongst them is “A Computer Chip That Thinks – Neuron-based chips could solve unconventional problems” featuring IBM team’s work on SyNAPSE / Cognitive Computing. On December 6, 2011, The New York Times ran a series of articles on "Future of Computing" which included an in-depth profile of DARPA SyNAPSE project by Steve Lohr with quotes from Dr. Todd Hylton, Professor Rajit Manohar, Professor Giulio Tononi, Professor Chris Kello, and myself.